Cushing Academy is a private co-educational secondary school founded in 1865 and located in Ashburnham, MA. They have partnered with a design firm called Corey, McPherson, Nash to redesign their viewbook. Through a web-based search, CMN contacted Randal Birkey Illustration and contracted for a new Campus Map to be produced both for the school viewbook and their website. Randal worked from maps, photos and other references provided by CMN and Cushing Academy. 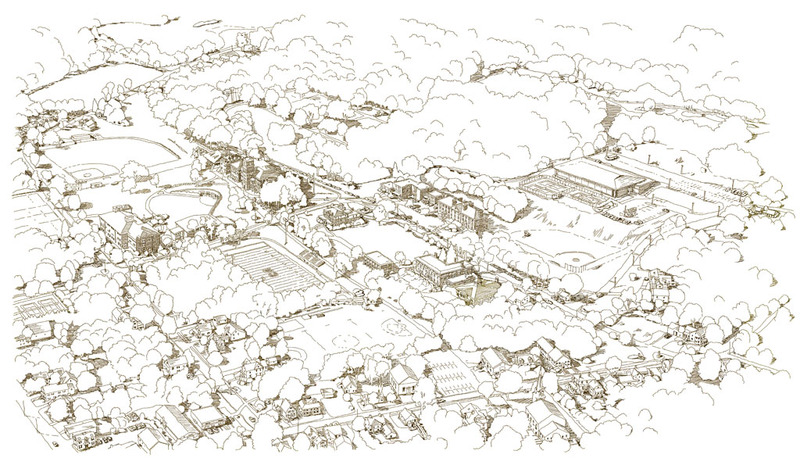 The first stage in the illustration process was to produce a line art “pencil” of the aerial perspective view that best displayed the campus. This line art was done in sepia tones using Corel Painter at a size of 6450 x 3750 pixels. Once this “pencil” was reviewed and approved by the design firm and the client, Randal then added digital watercolor to a layer below the line art using Corel Painter. The final file was converted to Adobe Photoshop and delivered as a layered Photoshop file with line art on one layer, and color washes and texture on the background layer. 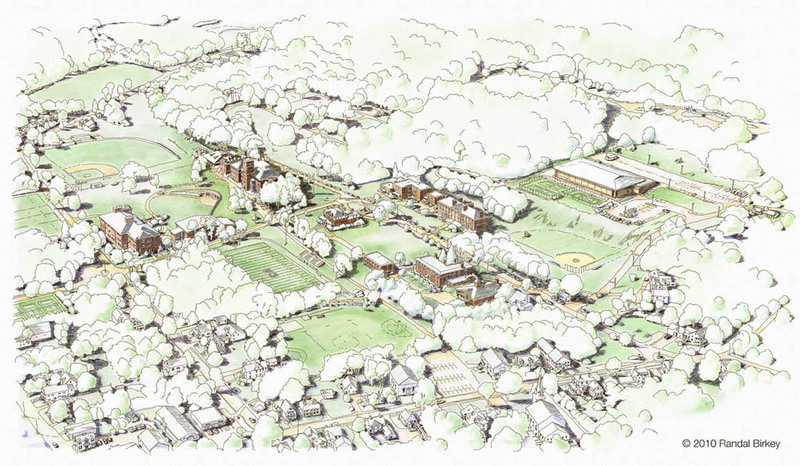 In this stylized version, the forested areas around the school campus were left white or blank in order to allow the buildings, streets and other fields to have visual prominence. The design firm will add all the labels and key to the site during the print production process.